January 31, 2014 (LocalOrg) - Rice farming and agriculture in general is an integral part of Thai history, culture, and Thailand's economy both past and present. Today, however, big-business and global markets have pushed farmers here in directions that may ultimately be self-defeating. Trapped in what can be called a "chemical loop," and with multinational big-agri hovering nearby waiting to corrupt, capitalize, and monopolize Thailand's agricultural-genetic heritage, solutions need to be found. Image: From Asia City Online's interview with organic farmer and owner of Ploen Khao Baan which promotes organic farming in Thailand. One such solution is helping farmers return to a more natural, self-reliant, and higher quality of farming - organic farming. In an Asia City Online interview with Nattawan Kamklai, owner of Ploen Khao Baan which promotes organic farming in Suphan Buri, province - some of these solutions are explored. It was health issues that spurred Nattawan to begin eating healthier, and flooding in Bangkok that disrupted urban infrastructure that made her think about the difference between self-sufficiency and precarious dependency on others. She deduced that despite all the luxuries urbanites surround themselves with, there are four basic requisites: food, home, medicine and clothes. Indeed, and developing local solutions to address all of these, independently and out from under big-business monopolies has been the focus of many who realize real power comes from exercising it yourself through technical and pragmatic means, not empowering others to do it for you at the ballot box. Leveraging technology so one individual can do more and do it better, than previously done by large corporations or governments, is truly the best way to redistribute wealth and empowerment across society. 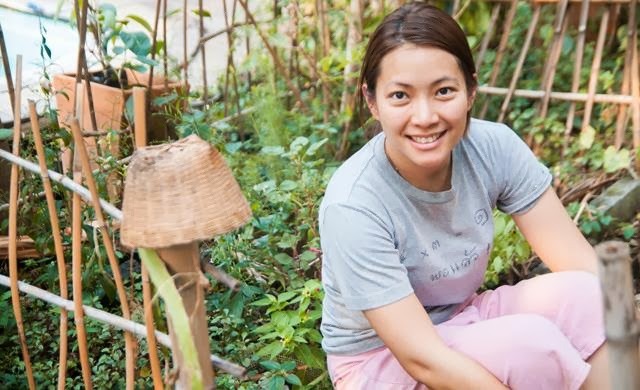 In Nattawan's case, she decided to focus on agriculture and in particular organic farming. In Thailand, there already exists organizations that specialize in imparting knowledge of organic farming to both farmers who wish to make the change, and urbanites who wish to get their hands dirty for the first time. One of these is the Khao Kwan Foundation - located about 2 hours north of Bangkok. Nattawan would begin her journey here, learning the basics, before starting her own pro-organic organization - Ploen Khao Baan. Research, field work, and a sense of mission turned her personal ideals into tangible and pragmatic solutions that not only solved her own problems - allowing her to both eat healthier and reclaim a degree of freedom and independence she previous lacked, but now helps others do the same through Ploen Khao Baan - which offers free training to farmers seeking to escape the "chemical loop." Farmers know how to live on their own, finding and growing food independently, not like city folk who need money for food. Urban people forget what’s natural. They think they can control everything with money. They never think of self-reliance, which is a basic fact of healthy living. We should stop going crazy about how things look, then farmers won’t feel pressured to use chemicals for perfect-looking produce. Remember that nature isn’t perfect. As end users, we’re the most important in this cycle. If we request organic food, then farmers will produce more. Indeed - it is the decisions we make everyday, in how we invest our time, money, and attention, that determines the true shape of society, not "elections." Elected representatives will always serve those interests who pay best - so in order for the average person who is unable to pay anything at all, true change will have to be the result of our own two hands. And for those that are unable to begin farming now - simply eating better, and supporting farmers who have made the choice to do better for themselves and others - it is a small but important step in the right direction.